Restormel Castle overlooks the stunning and picturesque River Fowey. It’s a standard “motte and bailey” style of castle which was first erected circa 1100 and is surrounded by a moat which is very wide as well as deep. It has since dried up to dirt and rocks. Restormel Castle, albeit of standard design, is quite unique in its circular keep which enclosed the principal compartments of the castle itself and, if viewed from above, resembles an amphitheatre not unlike the Globe of the famed William Shakespeare. 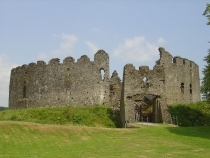 The drawbridge was the way in which one was to enter Restormel Castle. There is evidence, however, to suggest that a second drawbridge had been used at some point within the square Gate Tower. There is not much left of the original castle, however there are some bricks of masonry from a very early date that can still be seen at the base of the Gate Tower. The construction of the huge stone Keep during the early days of the 13th century would have been the replacements for failing and inadequate wood defenses. Amazingly enough most of the battlemented parapet still remains and in fairly decent order as well. Nearing the end of the century found most of the main castle buildings being completed including living quarters, kitchen a great dining hall all of which were located around a circular court yard. A well chamber was located in the courtyard and served as the original and main water supply. Additional sources were later added to bring water from a natural spring which was located on higher ground outside of the castle walls. Sections of lead pipes have been found inside as well as outside of the castle suggesting a flowing water system of some sort. At the time that the chapel was added a wide arch was cut through the stone wall of the keep that lead to a rectangular eastern projection that was specifically built for the chapel. Nothing much remains of the chapel or the archway; however an arched passage still remains to the south of the altar. As history went on Restormel Castle has belonged to the Crown over much of this time with the final date being 1299. After this date Restormel Castle has belonged to the Duchy of Cornwall which was originally the Earldom of Cornwall. This provides income for the Sovereign’s oldest son. Edward, known as the black prince, was known to have visited the castle on at least two separate occasions with one being in 1354 and another 11 years later in 1365. He made the castle his home for a time. Long before the Civil War the castle buildings were abandoned and began to fall into ruin. The castle, however, saw a bit of a revival when the Parliamentarians garrisoned the Keep. The castle was captured August 21st, 1644 and from that point on it was left to decay. Restormel Castle, now found on a very quiet Cornish countryside continues to show off its air of wealth and power as it overlooks the valley from on high. The castle is no longer surrounded by a deer park as it was in its hay day but makes a very pleasant spot to picnic in regardless.